Known as the "Land of 10,000 Lakes"
The Land of 10,000 Lakes, is no exaggeration; there are 11,842 Minnesota lakes over 10 acres (0.040 km2) in size. 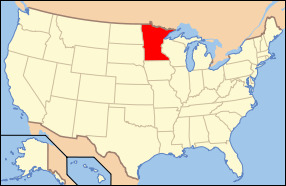 The state of Minnesota is located in the region of the Midwestern U.S. And was actually carved from the eastern part of the Minnesota Territory, and joined the union as the 32nd state in on May 11, 1858. The state is well known as the “Land of 10,000 Lakes” and its state name is derived from the Dakota word for “sky-tinted water”. The combination of the thousands of bodies of water in addition to the parks, forests, and other various wilderness areas draw the attention of many tourists and outdoor enthusiasts from across the country. Minnesota is the 12th ranked most extensive state in the country with a total land area of 86,939 square miles and is the 21st ranked most populated state with a population of 5.34 million. The capital of Minnesota is the city of St. Paul. A large majority of the population resides in the Minneapolis and St. Paul metropolitan areas of the state which is the core of business, transportation, education, and industry in the state. Much of the remaining land in the state is made up of prairies which are used for agricultural purposes, and forests which have been cleared for the use of farming. The major industries in Minnesota are farming (soybeans, corn, sugar beets, dairy products, and wheat), paper pulp and iron ore mining. Minnesota is ranked as one of the healthiest states and has a very literate population as well as one of the highest voter turnouts. Most of the people living in the state have German and Scandinavian descent in them, and the state is also known to be the core of Scandinavian American culture. Aside from the thousands upon thousands of natural lakes in the state, some of the more popular bodies of water include the Minnesota River, Red River of the North, St. Croix River, Rainy River, Mississippi River, Rainy Lake, Mille Lacs Lake, Upper Red Lake, Lower Red Lake, Vermillion Lake, Lake of the Woods, Leech Lake, Lake Pepin, Lake Winnibigoshish, and Lake Superior. The highest point of elevation in the state is Eagle Mountain which peaks at 2,301 feet above sea level. 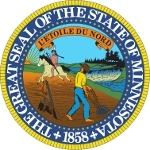 The state bird in Minnesota is the Common Loon, the state fish is the Walleye, the state flower is the Pink and White Lady's Slipper, and the state tree is the Norway Pine Tree. The state of Minnesota has a very unique geography that is perhaps the most beautiful in the entire country as continues to be a top destination for outdoor enthusiasts across the country. The original name of St.Paul Minnesota was Pig's Eye. It was renamed St. Paul in 1841.